Once again I would like to thank everyone for the awesome comments. So, I haven't posted one of these in a while so I thought now would be a good time. Well first things first is that the single player mode is not going to happen, I was messing around with the game-play for it and it wasn't any fun. So I made that single player game mode into a 2-player game mode. So by the looks of it this game upon initial release will be strictly 2-player. However the new game mode is a lot of fun to play with another person. Unfortunately I won't have video to show you guys because my internet has been acting a little slow these last couple days. But here is a picture. It looks the same as the other game mode (Dog Fight) but instead of killing each other your killing each other to get the food first. Whoever has the most food when time run out wins. There have also been some bug fixes. So far I haven't seen any more bugs so that part is good. By the looks of it, music will not be in the game. I recording equipment is very cheap, but I plan on getting some better equipment for further endeavors. I will try to get another log up tomorrow but I mean we'll see what happens. So for today I finally found a solution to this re spawning problem I had. So now that that is finished I decided to take it easy on the technical side of things and reworked some of the visuals. I found some very nice assets that looked perfect for the game that I am using, I don't like to use other peoples work in my games but I saw the assets and they fit perfectly with what I am trying to accomplish right now. The sandbags, tanks and trees are not mine and were downloaded the Kenney.nl. Meanwhile these will hold as permanent assets unless I have time in the end after completing everything else to make my own versions of them. I also got my main menu looking better. The Map in the background moves slightly. I would love to add some music but my microphone isn't good enough to record quality music. So that is something that will need to be worked out if I want music in the main menu. Hey, Thanks sooooo much! I have never heard of behavior trees before. I will look into it and see if AI would be something that could make it into the game before the end of the Jam. So first off I want to thank you guys for your awesome comments, it really helps me stay focused and motivated. Anyhow, yesterday was a very slow day for me. I actually spent more time playing games instead of making them, But I did get some stuff done. 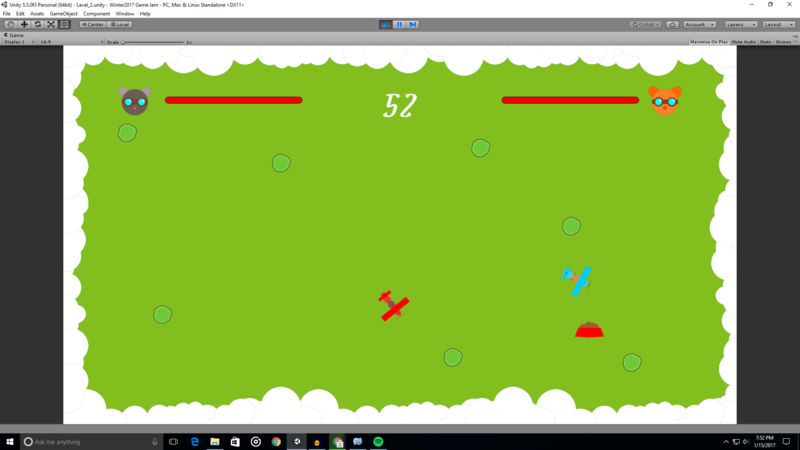 The two player mode is near complete, just a few things left that hopefully will get done today. Here is a video for some of the game play. Today I plan on starting the single player mode. Hopefully before the end of the Jam I could get an AI so it would make single player more fun, but I don't have much experience with AI so I guess we will see what happens. So on Day 2 nothing really got done because the power was out for a majority of the day, However I did get a snow day today. So I have been spending today working on the main menu. I still have a bit of work left on it. I'm planning to have the world map in the background move slightly. I Plan on getting rid of the faces and the planes and give the buttons more permanent textures. Oh and I would like to give the title a texture rather than some plain white text. 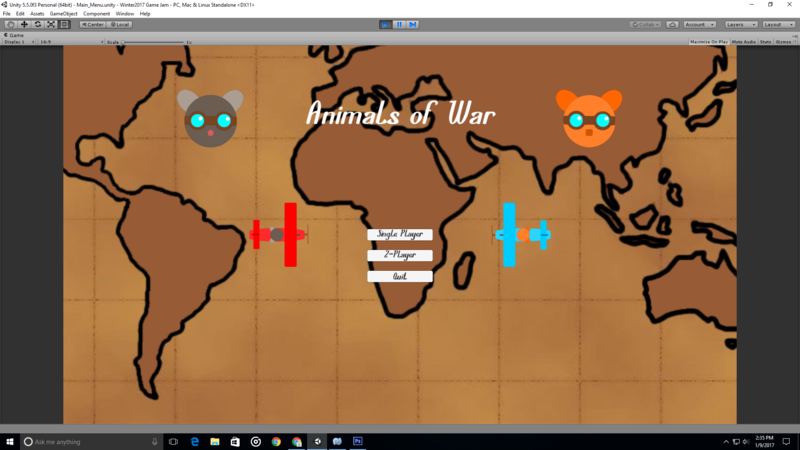 Animals of War is going to be a 2d top down dog fighting game (dog fighting as planes of course). 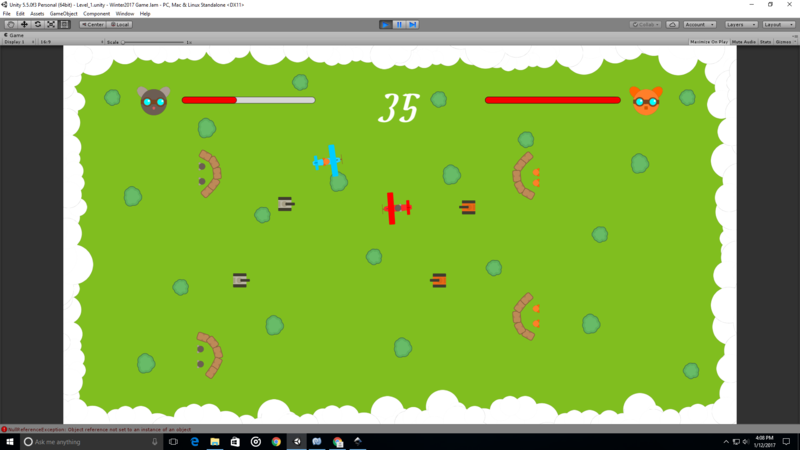 It will start off as a two player game but I would love to add some AI into the game so it can be played in single player, but that is something I doubt I will be able to finish in time. The background story hasn't been made yet but i'm thinking of something along the lines of how WW1 started but instead of humans it's going to be cats and dogs. By the way this is taking place in a WW1 era. Audio is something I have never really done before in a video game. I normally use 8-bit sounds from the internet but now I am actually trying to record sounds. I'm realizing just how hard it is. I have been trying to make a sound effect for a gun but it just isn't working out. I've been trying different methods of recording, I've been constantly altering the mic position and have moved to recording under my desk. I got some towels that seem to dampen some of the noise, but in the end it is a $5 microphone that my brother gave me. I managed to get an alright engine noise for the planes, but that's about it. Anyhow I'm going to go back under my desk and continue to make a bunch of monkey sounds. Hi my name is Logan, I am currently a Junior in high school. I love playing the guitar and enjoying the snow in winter. I started learning to make games a few years ago but never really did anything. I was always playing video games instead of making them. I just released my first game just last summer on the App Store. The game is called Sqwared and can be downloaded for the iPhone and iPad (iPad version doesn't really work). I never got the game to work perfectly on all resolutions, but it was more for the experience of putting a game on the market. I love making games however I often find myself getting distracted with other things and never finish the project. I'm hoping that by entering a Jam that I will focus more and be able to get the project done. I also love challenges. My most favorite game series of all time is hands down the Jak and Daxter series. My brother first introduced me to this series a while ago and fell in love with it. The story of the games were so amazing, the relationships you build with the characters in the game and the incredible plot twists that unfold later in the series were and still are some of the best I have ever seen and experienced in a game. Anyhow I remember thinking one day that "If I love playing games so much, why don,t I make one myself?" So I started learning to program and and make some art and a few years later hear I am entering my first game jam. I currently use Unity as an engine for making games. I have taught myself various programming languages, however I mainly use C# when using unity. I love playing video games, playing the guitar, and skiing. This will be my first game jam, I am super excited and can't wait to get started.